Chef Greg and his staff at Loews Santa Monica Beach Hotel provided favorites to please a bevy of guests with their Chrismakuh menu this holiday season. The unique menu at $75.00 (without wine) included 1st course selections of sweet potato latkes, cheese fondue, white truffle custard egg, or Hawaiian big-eyed tuna; 2nd course of butternut squash soup, mushroom cappuccino, hearts of palm with Maine lobster, or ultra speckle green salad; 3rd course of prime ribeye mignon, seared wild caught salmon, black cod loin, or roasted ghuni hen and dessert favorites included "cookies n' cream", chocolate hazelnut crunch, rosemary-heirloom apple tart and holiday sorbet selections. 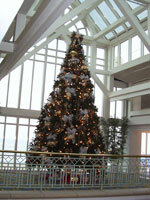 Each year this hotel is so beautifully decorated, and is a delightful place to have family celebrations. I have done this with my family in years past, and always enjoyed it so very much. For information visit www.loewshotels.com.